Technology has been changing the way we live our lives for years – better plumbing improved bathrooms early last century and microwaves changed mealtimes for many in the 70s. So how can we expect technology to change our homes within the next five years? Because of increasing concern over energy consumption, the rise of the Internet of Things (IoT), and the increase in voice-enabled AI devices, technology developers are working on making our homes smarter and more convenient to live in. Below are some of the technologies we can expect to become commonplace in our homes over the coming years. It takes a lot of energy to power our homes. Energy use in houses has increased by 37% just since the 80s, and 70% of the electricity used by the nation is sourced from homes and buildings. Concern over energy consumption is powering innovation to ensure that while our reliance on more devices and appliances grows, our energy use doesn’t skyrocket along with it. Smart meters can now be found in more than half of American homes with an expected 90 million devices projected to be used in homes by 2020. These devices enable consumers to access data on how much power it takes to run their home in efforts to empower homeowners to reduce their energy consumption. For energy providers, these meters provide several benefits. They negate the need for manually reading meters, assist in determining price as per demand, and also work to reduce blackouts and outages. The better, brighter lighting of LED bulbs which use 85% less energy than incandescent bulbs are also becoming common in homes across the nation. The proliferation of the alternative lighting of our homes and buildings quadrupled from 215 million units in 2014 to 874 million units in 2016. Adoption of the brighter (and sometimes even cheaper) alternative has been more common for outdoor applications than indoor, but this is expected to change over the coming years. Thanks to the wide adoption of smartphone technology, almost anyone can control their home systems from practically anywhere in the world. A range of different apps have become available that allow people to remotely control their homes by connecting with the smart technologies installed in the home. The Nest app allows for control of your home’s heating and cooling thermostats. The Wink app provides users with access to controlling lights, blinds, air conditioners, door locks, and more all with one touch. Homeowners can even install technology that enables users to remotely water their plants. While these smartphone apps typically focus on a single function or control, many of the home assistants on the market, such as Amazon’s Alexa, enable you to connect all your homes functions – heating, lighting, home security, and more, by enabling various skills. Furthermore, Alexa can now do your bidding when you’re not there by installing the Amazon app (for iOS) or Alexa app (for Android). More than 50% of American homes are expected to be using this kind of technology by 2022, so if you’re concerned you’ve left the heating on, you’re likely to have the technology to turn it off and have it on again when you return. The Internet of Things (IoT) is pushing the acceptance of smart appliances in the home. Chores such as grocery shopping will soon become redundant as our white goods take over much of the burden. Almost every home in America has a refrigerator, and nearly one in four homes has two according to CNN money. While fridges themselves aren’t particularly new, smart fridges are on the rise and set to change American homes. 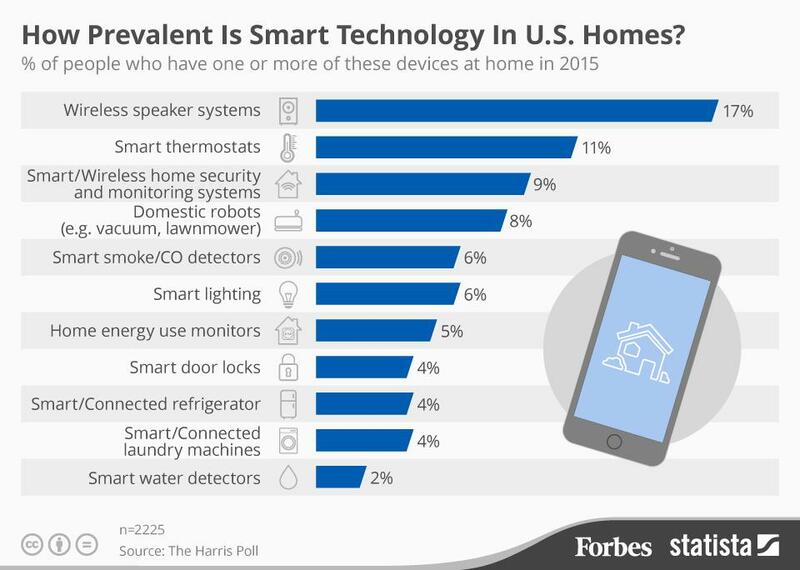 Only 4% of homes had smart, connected, refrigerators in 2015 and a high selling price was reported as the number one reason that they weren’t more widely used and accepted into homes. Manufacturers and food retailers are considering plans to reduce the cost of these appliances with subsidies which they hope will increase their market share and get more smart fridges into homes across America. If successful, weekly grocery shopping may become a chore of the past as it is delegated to the fridge and other smart appliances instead. In the early days of improved AI and automated technologies, the conversation focused heavily on big industries, manufacturing, and data management for business. Now, developers have conquered the barrier of creating user-friendly technology that have entered our home lives. The amount of smart home devices we are seeing will only continue increasing in the coming years. Technologies of the future will focus on eliminating common household chores, implementing more surveillance applications, and increasing the integration of voice control. These further developments in creating smart homes may eventually lead to even bigger movements to create more smart communities and then smart cities, automating many aspects of our lives.